As the exclusive distributor of Horton Automatic products, we are proud to present our new range of optical safety turnstiles. 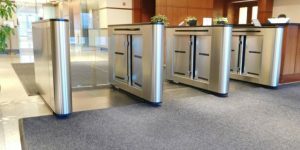 At the cutting edge of technology and very aesthetic, our different types of security turnstiles will meet your needs. 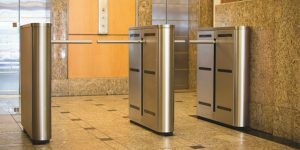 Here is a brief summary of the different types of optical safety turnstiles. Follow the links for a full description and technical documentation. The SentryLane 3000 Series, is a high-speed, aesthetic and efficient safety turnstile, available with one or two locking arms, which automatically retract. 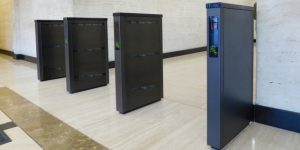 The turnstile is also equipped with a unique optical safety beam system that maximizes the speed of passage for authorized persons and prevents access to unauthorized persons and double passes. The SentryLane 3200 Series, is a high-speed all-optical safety turnstile. The operation is as follows: when a person approaches, she presents an access card. When access is allowed, green arrows appear on the top of the pedestal pointing in the direction of passage permitted. When access is not allowed, red Xs appear on top of the pedestal and an audible alarm sounds.